This would be me, if I were an elephant. I would be pink and rock retro glasses. Meet Ellie, she's a big dream follower, just like me. Today I realized that I am beyond blessed to be doing what I absolutely dreamed of, and I'm making a living while doing it. I can't think of a better scenario. What a scary jump it was to take the plunge, but I would never look back now. Don't be afraid of a little mouse. 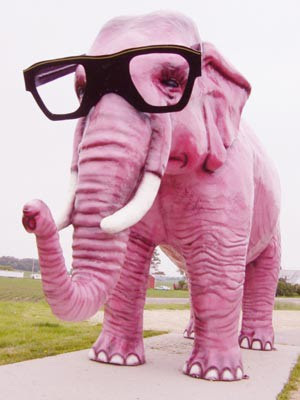 You are a big pink beautiful elephant and you too will shine when you follow those dreams and do what you love. Congratulations Lauren! So proud of you! Truly an inspiration! You go girl!! You're doing it BIG TIME! Right there with you sister! I am going to frame this picture of Ellie to remind me to continue following my dream. I am SO proud of you for all you have done. keep it up girlfriend!!! Thanks for all the great comments gals! I hope this has inspired some of you to either keep following that dream goal, or take the jump! I'm so proud of you all who commented that you are doing the same. Keep it up, and rock those glasses!